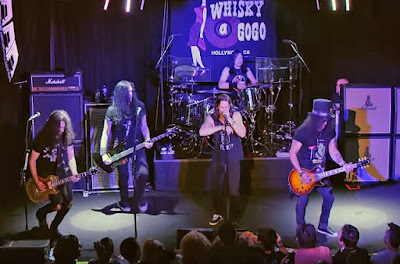 The band were filmed during an exclusive show for SiriusXM subscribers at Los Angeles' Whisky a Go Go on September 11 that also included the live debut of several songs from the Guns N’ Roses guitarist’s latest studio project. 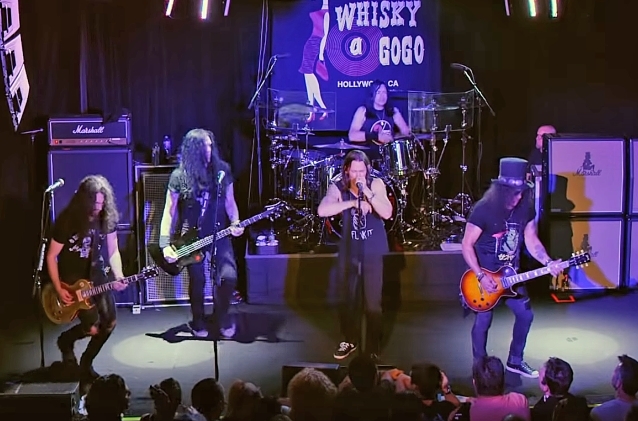 The live footage follows the recent release of an animated live-action clip for “Driving Rain” that saw Slash team up with the crew at Stoopid Buddy Stoodios. "The idea behind doing an animated video for ‘Driving Rain’ is mostly due to the dark subject matter of the song influencing directors to come up with very dramatic, dark and sullen regular live action treatments that weren’t any fun at all (no offense to those guys),” explains Slash. “So, I wanted to create something that could be tongue-in-cheek and yet still be dark with live-action animation. "We're all big fans of Stoopid Buddy and they came up with a great concept and treatment. We love the video and it came out fn’ brilliant. Fyi, no puppets were harmed during the making of this video." Fans will hear the tune live as Slash and the band are currently playing dates on a fall tour of North America.